Hey Richmond, it’s about that time of year again. RVA Fashion Week is scheduled for April 15-21, 2012. It will be a week filled with fashion shows, designer showcases and more. I attended the finale show last year and was very pleased with what Richmond had to offer in the fashion field. So I’m super excited to see what’s planned for this years events. 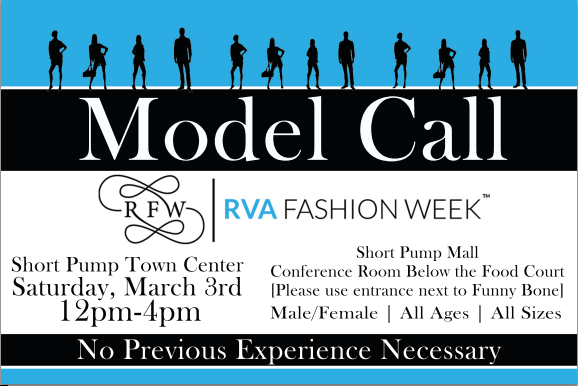 Tomorrow, Saturday, March 3, 2012, there will be a model call for both male and females, all ages, & “all” shapes and sizes.